Ice cream and dessert parlour on North End. It opened in April 2013. As of mid-February 2013 there was building work going on inside photo, and according to the workers it was planned to be an ice cream shop. 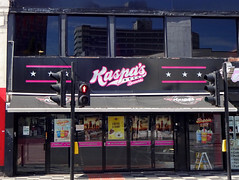 A sign appeared in the window in late February 2013 photo stating that the new shop would be called Kaspa's Desserts and would offer crepes, waffles, coffee, ice cream, and shakes. See Izza Hair & Beauty next door for other historical info. See also photo from early February 2013. Last edited 2019-01-08 17:11:11 (version 26; diff). List all versions. Page last edited 2019-01-08 17:11:11 (version 26).